The multiverse: Science or speculation? 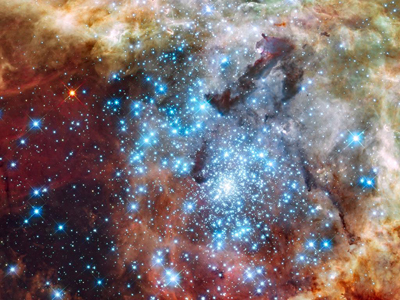 An image taken by the Hubble Space Telescope showing two clusters full of massive stars that may be in the early stages of merging. Image courtesy NASA, ESA and E. Sabbi (ESA/STScI). If you like to have your mind blown then cosmology is a good field to go into. There's talk of other universes, extra dimensions and even disembodied brains randomly fluctuating into existence, all in the name of science. But is it science? Many of the things cosmologists talk about can't be tested in experiments and perhaps never will be. So should we dismiss some cosmology as mere speculation? Speculation, maybe, but that shouldn't necessarily lead to dismissal, says mathematician and astronomer Bernard Carr. "When you get to the edge of physics you are obviously grappling with concepts that are very new, and which most physicists are not used to," he says. "They might take you beyond the concept of science as it is normally applied." History has taught us many times that theories that once appeared speculative (like the Earth being round) eventually turned into established fact. "Concepts of the world and the laws which control it and indeed the nature of science itself have changed — systematically," says Carr. "At every stage there has been opposition, people have said, 'No, this isn't proper science, this is just metaphysical speculation.' At the time that might have appeared a logical perspective, because it did seem that one was proposing ideas which couldn't be tested. However, history showed that if you waited a bit longer the developments in telescopes or conceptual ideas allowed one to accommodate this extended branch of phenomena." You can listen to our interview with Carr in a podcast. This is undoubtedly true, but cosmology has a special problem. Other sciences proceed by experiment. You observe something, say a chemical reaction, come up with a theory to explain what you saw, and then observe many more reactions to see if your theory fits. When you are doing astronomy you can't do this, but at least there are millions and millions of stars and galaxies at different stages of their evolution, and observing them counts as an experiment of sorts. Astronomy has therefore become an accepted part of science. But once you talk about phenomena that extend across the boundaries of what we can see, both in time and in space, you're in a very peculiar situation. You just can't test things. One idea that epitomises this problem is that of the multiverse. The idea is that our Universe is only one in a whole bubble bath full of other universes. Each of them comes with its very own laws of nature — some universes may be very different from ours, and others may be similar. Some may be cold and lifeless expanses of empty space, and others populated by three-headed humanoids. It's beautifully mind-bending. Cosmologists have developed the multiverse idea for good theoretical reasons (you can find out more here). It's not so much a theory as a concept that has arisen several times out of different considerations. Perhaps the multiverse is not quite as shocking as it first appears — like so many earlier ideas, it simply moves us humans and our experience further away from the centre of the world. "It would seem to me very arrogant to assume that our visible little patch is all there is, in fact that's indisputably incorrect," says Carr. "What we observe cannot be the whole Universe, no one would deny that. The question is how far the Universe extends and whether there are lots of other disconnected universes." Bernard Carr is a mathematician and astronomer at Queen Mary, University of London. The trouble is that, by their very definition, the other universes are inaccessible to us. If there was hope we could one day visit them, then they wouldn't be other universes, they'd simply be far-away patches of our Universe. "The question is whether it's science to speculate about such things," says Carr. "That comes down to whether there can be any observational evidence for them. You can't directly see other universes, by definition, but that doesn't mean there cannot be indirect evidence for them." For the multiverse there is some hope that indirect evidence may appear. Partly this comes from what are called dark flows. "The idea is that there is a large region in the observable Universe which seems to have a peculiar motion," says Carr. "This motion is, according to some observers, generated by a large amount of mass beyond our own horizon, [which is given by] the distance light can travel since the Big Bang." So perhaps there is something, another universe, outside our horizon. "But the evidence is controversial," says Carr, "Not everyone accepts that interpretation." Another place where evidence for the multiverse may appear is the cosmic microwave background (CMB) — that's the left-over radiation from the Big Bang, which we can measure very precisely. The idea is that some other bubbles of the multiverse may have collided with ours early on, and that these collisions would then have left tell-tale signatures in the CMB. "We don't yet have any definite evidence for that, but people have done simulations in the multiverse models, and it's clear that in principle you could find such evidence," says Carr. An image of the CMB taken by WMAP. Credit: NASA/WMAP Science Team. With the possibility for indirect evidence in the future, maybe we shouldn't dismiss the multiverse as mere speculation, especially since it has many features that are theoretically attractive. So attractive that some have even suggested we change the criteria of science in order to accommodate it. "The key question is: how crucial is testability?," says Carr. "My view is that it is crucial; you do have to be able to test a theory to make it science." He advocates classifying ideas like the multiverse in a special category he calls meta-cosmology: outside the present boundary of science, but not on the far end of fiction. "It's a sort of intermediate state, a state of purgatory, before you've decided whether [something] is proper science or not." Given the lack of evidence, the ease with which physicists bound around the idea of the multiverse is perhaps surprising. But then, science would never had progressed as it did if people hadn't dared to lean over the precipice of accepted knowledge. But there are other ideas which most physicists currently don't dare to go near. One of them is the question of consciousness and its relation to the reality we perceive. "I personally think that consciousness is probably a fundamental rather than an incidental feature of the Universe," says Carr. "The problem of consciousness is definitely in the meta-cosmology domain, and is likely to remain there for a long time." But people are beginning to make very tentative inroads. We talked to Carr at a conference that brought together cosmologists and philosophers to attack some of the knottier problems in cosmology. "The very fact that cosmologists and philosophers are involved in a dialogue is what, in some sense, makes raising that topic respectable." You can listen to an interview with Bernard Carr here. Marianne Freiberger is Editor of Plus. Plus talked to Carr at the International Philosophy of Cosmology, which took place in Tenerife in September 2014. See here for other articles and podcasts relating to the philosophy of cosmology.